Designed to promote increased muscle mass when combined with exercise, powdered protein supplements provide the foundational amino acids required to naturally build muscle tissue quickly and efficiently. In addition to muscle building, proteins have key roles in many biological processes. Required for the structure, function and regulation of the body’s tissues, cells and organs, proteins are necessary for the manufacture of hormones, antibodies and enzymes. Protein powders are popular among individuals seeking muscle growth, improved body composition and nutritional value. There are numerous types of protein powders obtained from a variety of sources, such as whey, casein and plant-based proteins. Protein powders can provide high-quality protein in a concentrated, convenient form. However, protein supplements are not necessarily a substitute for whole food protein, but rather an adjunct protein source. 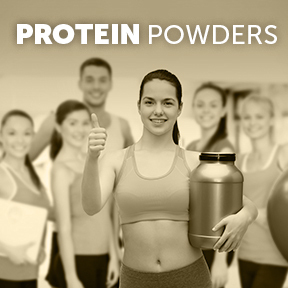 There are different forms of protein powders including concentrates, isolates and hydrolysates. Concentrates use heat, acids or enzymes to extract protein from whole food. Concentrates typically contain 60 – 80 percent protein and 20 – 40 percent carbohydrates and fats. Protein isolates undergo additional filtering processes, removing more fats and carbs and providing a higher level of 90 – 95 percent protein. Additional heating and processing that breaks intact protein down into single amino acids produces highly bioavailable protein hydrolysates. This allows for rapid absorption, thereby maximizing nutrient delivery to muscle tissues. Research shows that whey protein has the ability to promote muscle mass and recovery. Both whey and casein promote satiety and fat loss. Plant-based proteins, such as pea, hemp, or brown rice, as well as a blend of plant proteins, can provide a good protein foundation for vegans and vegetarians. Whey: Whey is a water soluble, dairy-based complete protein. It contains all the essential amino acids the body requires and is easily digested and quickly absorbed. Whey protein provides all nine essential amino acids with a high amount of the amino acid leucine. Leucine is key to protein synthesis and plays a major role in promoting muscle growth and recovery after resistance or endurance exercise. Studies have shown that supplementing with whey isolate or concentrate led to improvements in lean muscle mass and strength in individuals who exercised regularly. Both are high quality proteins, although nutritionally whey concentrate has more fat, carbohydrate and lactose. Casein: Sourced from dairy curds, casein is the main protein found in milk. As a complete protein, casein provides generous amounts of essential amino acids. Casein is higher in glutamine than whey, and is slowly digested, resulting in a steady prolonged release of amino acids into the blood stream. Casein is correlated with greater muscle protein synthesis, and improved body composition in weight training programs. Because casein is known as a time-release protein that provides the necessary amino acids for repair and effective muscle growth, some prefer to take casein protein before retiring for the night. Soy: Due to its natural phytoestrogen content, soy remains a somewhat controversial food. Soy protein isolate powder is processed to contain very little fat, fiber or phytoestrogens. Rich in nutrients, soy is a complete protein, containing all the essential amino acids. Soy protein often serves as major source of all-important protein for vegans and vegetarians. For others, research suggests that combining soy with dairy proteins may result in greater muscle protein synthesis. Although soy protein contains leucine, it may not be quite up to par with whey protein for muscle building. Studies have shown that for appetite and weight control, a soy-based high-protein diet may boost weight loss as effectively as a meat-based high-protein diet. Overall, soy is safe for most people and may offer potential health benefits, including weight loss and decreased risk of certain cancers. Pea: Suitable for vegans, vegetarians, and those with allergies or sensitivities to dairy, pea protein is sourced from the yellow split pea, a high fiber legume. Pea protein provides all but one of the essential amino acids, and is rich in branched chain amino acids (BCAAs), leucine, isoleucine and valine. BCAA supplementation has been shown in several studies to support muscle building, prevent muscle wasting, decrease muscle fatigue and alleviate muscle soreness post exercise. Protein powders may be selected based on dietary preferences, food tolerances and health and fitness goals. It is generally recommended that individuals not consume more than 30 grams of protein at one time. Many protein powders provide approximately 20 grams of protein per serving. 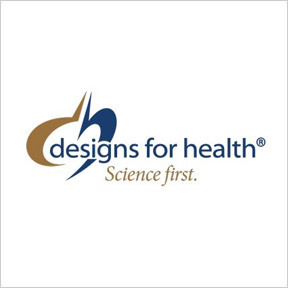 Whey Cool™ Protein by Designs for Health®: Whey Cool™ features low carbohydrate, non-denatured whey protein sourced from cows that graze on pesticide and chemical free, non-GMO New Zealand pastures. Gluten, growth hormone and antibiotic free. Low in sugar and 23 grams of protein per serving. Available in Natural, Chocolate and Vanilla flavors. Naturally Casein Protein Powder Vanilla by Eat The Bear: This low-carb all natural protein powder features sustained release amino acids in a non-GMO, rGBH-free micellular casein form. All natural whey protein is sourced from the milk of grass-fed cows. Stevia sweetened, naturally flavored, 23 grams of protein per serving. Klean Isolate™ by Klean Athlete®: This non-flavored, non-sweetened clean whey isolate powder provides a source of protein and branched chain amino acids in support of the maintenance and repair of body tissues. NSF Certified for sport. 20 grams of protein per serving. Alive! Ultra-Shake™ Soy Protein Vanilla by Nature’s Way: This comprehensive protein enhanced whole food formula provides vitamins and minerals, amino acids, digestive enzymes, green foods, organically grown mushrooms, antioxidants and other nutrients for whole body nourishment. Specific ingredients support energy production and immune defense, as well as bone, colon, eye and cardiac health. 14 grams of protein per serving. ProVeg Organic Pea Protein by Vital Nutrients: This plant-based organic pea protein powder provides a comprehensive amino acid profile and 23 grams of protein per serving in an easily absorbable formula. Soy, gluten, egg, sugar and dairy free, Non-GMO formulation. Naturally flavored. No artificial coloring or preservatives. Generated by the body as inevitable byproducts of normal metabolic processes, free radicals, or reactive oxygen species (ROS), must be balanced by antioxidants for proper physiological function. A certain amount of free radicals are required and produced by the immune system to help destroy invading pathogens and viruses. Some free radicals are necessary enzyme precursors, others aid in the production of vital hormones. The body’s ability to use oxygen and metabolize food into chemical energy depends on a chain reaction of free radicals. During this oxidation process, oxygen-charged molecules containing unpaired electrons are released. Electrons are negatively charged particles that normally occur in pairs. Free radicals are unstable atoms with unpaired elections making them highly reactive with other molecules. 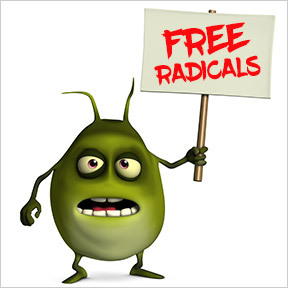 There are many types of free radicals, as well as molecules that stabilize them. All free radicals share a voracious appetite for electrons. In order to stabilize itself, a free radical very quickly pulls an electron from the nearest stable molecule. This electron theft can radically alter the structure or function of the newly destabilized molecule, disrupting and damaging cell membranes and altering what may enter and exit the cell itself. Although under constant attack, the body is not defenseless against free radicals. By producing antioxidant substances, such as glutathione and ubiquinol, as well as extracting antioxidants from the diet, the body strives for homeostasis, a balance in all things. Antioxidants are able stable enough to donate an electron to a free radical without becoming destabilized. Oxidative damage occurs when free radical production overwhelms the body’s antioxidant defenses. When the antioxidant supply is insufficient, excessive free radical formation can not only result in irreversible cellular, organ and tissue damage, but can harm nucleic acids, proteins and lipids as well. While free radicals are crucial to energy production and immune function, an excess of free radicals and low levels of antioxidants is associated with increased risk of developing many pathological conditions such as diabetes type 2, vision loss, atherosclerosis and cancer, as well as respiratory, neurodegenerative, cardiovascular, and autoimmune diseases. Free radicals are also linked to cellular aging, as the cellular damage inflicted may accumulate with age and hasten disease progression. Many different factors can lead to an excess of health damaging free radicals. Radiation exposure, environmental pollutants, pesticides, tobacco smoke, heavy metals, alcohol, poor diet, pharmaceuticals, automobile exhaust and chemical solvents can all contribute to an excess of free radicals. Based on studies, some nutritional antioxidants will retard the aging process, suggesting that free radicals have a significant influence on aging, and that cellular damage can be controlled with adequate antioxidant defense. Further, optimal intake of antioxidants may positively influence life span by safeguarding genetic data during cell division. Intense aerobic activity can induce oxidative stress. Burning fuel in high intensity cardio exercise causes chemical reactions that form free radicals at a faster rate. However, those who exercise frequently appear to reduce oxidative stress initially brought on by physical activity, as unlike sporadic exercise regular exercise also enhances antioxidant defenses. A healthy and varied plant-based diet helps combat free radical damage. Antioxidant nutrients are found in a variety of colorful fruits and vegetables. Nutrients that have demonstrated the ability to help prevent or reduce the damage caused by oxidative stress include vitamins C and E, beta-carotene, flavonoids, proanthocyanidins, alpha-lipoic acid, selenium and more. Principle micronutrient vitamins C, E and beta-carotene must be supplied through diet or supplementation. Antioxidants work synergistically to neutralize free radicals, as each has its own unique chemical behaviors and biological properties. A diet high in antioxidant-rich foods won’t stop the aging process, but will support healthier, more graceful aging throughout life. Reduce stress to limit oxidative injury. Along with inflammation, stress induced oxidative stress is considered to be a causative factor in disease development and cellular aging. The chemicals cortisone and catecholamines created by mental stress can produce free radicals. As the body ages, the ability to fight the effects of free radicals diminishes, resulting in more cellular damage and leading to degenerative processes associated with age-related health decline. Along with conscious stress reduction, antioxidant supplements can help to combat the negative effects of stress on the body. AntiOxidant Formula by Pure Encapsulations®: This broad spectrum antioxidant formula provides essential vitamins and minerals, as well as a proprietary carotenoid blend, in support of the body’s natural defense mechanisms. Gluten free, Non-GMO hypoallergenic formulation. Ultra Anti-Oxidant by Douglas Laboratories®: This potent formula provides specific nutrients that effectively participate in the body’s defense systems that work to reduce damage to cells, organs and tissues. Ingredients include antioxidant vitamins, minerals, NAC, glutathione and a broad range of active nutritional free radical fighters. Free of wheat gluten, soy, dairy, sugar, yeast and artificial coloring, flavoring and preservatives. Ultimate Antiox Full Spectrum by Designs for Health®: This unique formula provides a blend of powerful herbs and spices, as well as specific antioxidant compounds, in support of the function and integrity of body structures, including cell membranes, proteins and enzymes. Gluten free, Non-GMO formulation. Anti-Oxidant Complex by Professional Complementary Health Formulas: This specialty complex is formulated to provide a full spectrum of synergistic co-factors and essential nutrients that work to protect cells and tissues from free radical damage. Ingredients include vitamins, minerals, CoQ10, turmeric, glutathione and more. Gluten and soy free, vegetarian formulation.